Tomorrow starts the big adventure for my summer. I leave to start hiking the 1,100 mile Ice Age Trail across Wisconsin with my friend Papa Bear from Seattle. He arrived safely by train and we've walked a few miles here while doing last minute shopping and preparation. I'll be back in about 7 weeks, but there will be blog posts from the trail. You can follow our progress at http://hikingdude.com with a tracking map and daily blog entries. Here on Boy Scout Trail, I'll let you know when I meet scouts on the trail or other (hopefully interesting) things happen. For example, I'll probably be staying a night at two or three different scout camps along the way. I also hope to meet a few troops in towns along the trail. 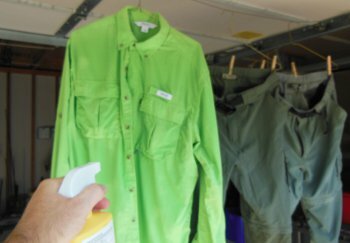 To prepare for the insects in the great north woods, I sprayed my BSA zip-off pants and my shirt with Sawyer's Permethrin product today. I'll let you know how that works. I expect no problem from bugs because I also have a bug mesh jacket with hood and pants sold by Coghlan's. I also sewed a pair of bug mittens out of tent screen from a worn-out scout tent. Once we get a cold spell, hopefully in early September, the bugs will not be such a bother. But, these first few weeks will make the prevention measures worthwhile.